Yes, I know: Intelligent people can be really nasty. What I want to explore here is why better intelligence is likely to foster more moral behavior. Let me turn this around, and ask ‘what factors tend to promote undesirable/ bad/ wrong/ immoral actions? Fear, one of our basic defense mechanisms, can make us lash out or act hastily. American reaction to 9/11 would be on good example. Reaction to recent US presidential election, another. Or, more generally, when parent’s fear for their children promotes the devastating War on Drugs, or excessive juvenile child-molestation laws and sentencing — destroying numerous lives quite unnecessarily. Humans inherently not very good at gathering information before acting. We tend to rely too much on previously-formed beliefs and to shun conflicting information. Similarly, we are more comfortable among like-minded people and thus risk an echo-chamber effect. Acting on mistaken or incomplete information often leads to doing others wrong, and/or hurting ourselves. The above examples would also apply here. While limited rationality is closely related to the knowledge issue, it has a somewhat different dynamic. Good reasoning skills require practice — a long-term development commitment. One needs to systematically reduce bad thinking habits, and learn to better avoid logical fallacies. Again, shortcomings here are more likely to make us do things that we will regret — be it entering into harmful relationships or impulsively lying or deceiving. Lastly, there are our ‘reptile brain’ impulses related to protecting our egos — emotions that provide short-term (false) comfort to our self-image. These include denial, lying, boasting, anger, and bullying. Obviously, actions or decisions made under their influence have a much higher risk of being ‘bad’. AGI, or human-level general AI, will by design be much less susceptible to these four factors than we are. All other things being equal, an AGI will be much less likely to engage in harmful or immoral behavior. Furthermore, and just as important, AGI companions or advisors can become like the fictional angel on our shoulder, guiding us gently towards better decisions: ‘Hey Peter, perhaps you should count to one hundred first, gather more facts, think about it a bit more, and give your emotions a chance to cool down’. 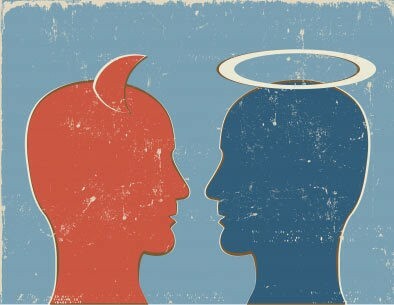 Additionally, we’d expect our super intelligence ‘angels’ to proactively give advice and help us think things through. Advanced AI has the potential to make us better people, and to help create a better world. Yes, there are uncertainties and risks attached to having AGI, but a good case can also be made that we actually need AGI to help guide us through this stage of human evolution, to help save us from ourselves.